There need to be more JRPGs like Zwei. There is something about the treasure-hunting, food-gathering, monster hunting game that just draws you in at every turn. The narrative, the characters, the battle and leveling systems; each aspect of the game is imbued with so much heart and a sense of self-awareness that instantly enthralls you with the world. Zwei II tells the story of a crashed pilot Ragna Valentine and the mysterious relationship he finds himself trapped in with the deposed Vampire Princess Alwen du Moonbria on the continent of Ilvard. After losing her castle and most of her magic to a powerful and unknown enemy, Alwen stumbles across Ragna and forms a Blood Contract with him, making him her “loyal” Blood Knight. After some convincing, Ragna agrees to help reclaim her lost magical power, which just so happens to be scattered throughout the depths of dungeons dotting Ilvard. The perfect quest for self-proclaimed Treasure Hunter Ragna. 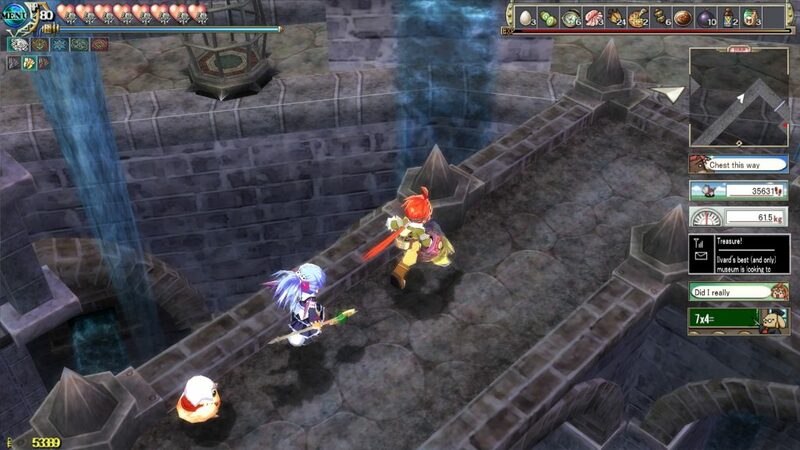 The game is a direct sequel from Zwei, which just received a North American port and will be covered in the coming days by Scholarly Gamers. The story is set within the overarching context of a Great War that occurred 500 years ago in Granvallen, between the Six Demon Lords and the devout worshipers of the goddesses of Light and Dark. Magic has been largely sealed away following the great war, but the world of Ilvard is one where magic and machinery coexist, although magic has largely disappeared. 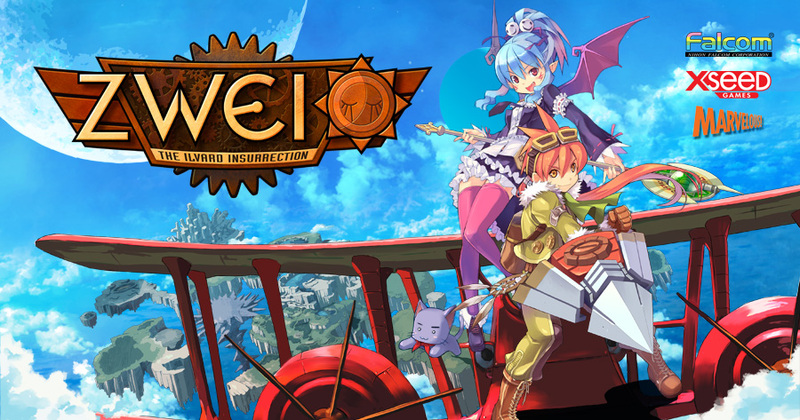 Zwei: The Ilvard Insurrection is a port of Zwei II, which was initially released by Nihon Falcom in 2008 for Windows. I never got a chance to play the original Zwei games so I was really excited to delve in and see how the port functioned. The 2017 North American release is almost the exact same as the 2009 re-release in Japan, including all of the additional features and a full English voiceover and captions. I was consistently impressed with how well done the English voice-acting was. The translations were clearly not done directly from the original Japanese, as is sometimes the case with English ports of JRPGs, but were rewritten completely so that they made sense and flowed organically. You can notice it the most in the English idioms, puns, and other jokes that are made which are specific to the language. I am consistently impressed with XSEED’s localization process; you know that a game with their name attached to it has been given the proper treatment. 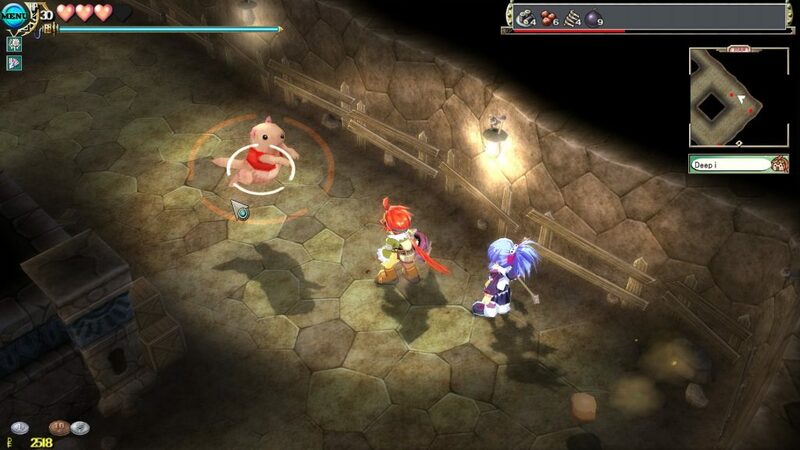 For anyone like myself who has never delved into a Zwei game, it plays in many ways very similarly to Ys. It’s a JRPG with a focus on simple but fast-paced open combat, shirking the traditional turn-based format of its peers alongside some of the trope-ier aspects of JRPG narratives that we see in some of the other localizations in North America. What you’re left with is a unique cast of characters and a story that will have you entertained and chuckling the entire way through. After breaking the package that he was supposed to deliver to the Museum/Hunter’s Guild in Artte, Ragna agrees to donate any treasure that he finds to the museum, which increase his Hunter’s Rank. A higher rank means better rewards when turning in treasure to the Museum, and you can even earn money from selling certain treasures to buy better equipment. The combat in Zwei is relatively simple, but the deeper you delve into dungeons — collecting artifacts for your Anchor Gear and the lost magical abilities of the Vampire Princess Arwen — the more the gameplay really opens up. Zwei features a dual-combat system which allows you to freely switch between Ragna and close-combat his Anchor Blade, and Alwen and her various forms of magic. The system is one of the features that defines the game, and it’s smoothly integrated into the combat. With the push of a button you can fluidly switch between the duo, seamlessly flowing between the two combat styles, allowing you to exploit enemy weaknesses and control your proximity to the fight. Once you have unlocked stronger upgrades for the Anchor Blade and have uncovered Alwen’s lost spells, the pair becomes a lot more versatile in their ability to tackle different types of enemies. Just because the combat mechanics are technically simple does not mean that combat itself was a cakewalk. One of my only complaints about Zwei: The Ilvard Insurrection is that difficulty seems to randomly spike in some fairly early dungeons, which caused me to have to restart from the beginning several times. Luckily, at least in some of these instances, you are able to bypass the difficult zones which are often indicated by a small “Warning” sign, followed by a large CAUTION that appears on your screen alongside audible alerts to give you one last chance to backtrack before being trapped in the fight. Monsters drop coins which can be used to buy upgrades, accessories, food which grants you experience, and even a new pet to accompany you on your travels. Perhaps the most intriguing aspect of Zwei: The Ilvard Insurrection is the experience-gaining system, which is wholly unlike anything that I’ve ever experienced before in a game. In addition to finding treasure you will often stumble across some tasty treats while spelunking. My favorite part of the game is the fact that eating food not only heals you, but gives you experience. That’s right. Food is power in Zwei, and you can find everything from sushi rolls to fried fish and pizza scattered throughout the dungeons, often gathered from the bodies of your vanquished foes. In towns, you can exchange ten of the same item of food for one supreme dish from the local chef, which will always provide you with more experience than 10 of whatever item you traded. Perhaps the most engaging aspect of the entire game is the wealth of interesting and unique characters, and the ridiculous interactions that they get in with Ragna and Arwen. Or the ridiculous interactions that occur between Ragna and Alwen. 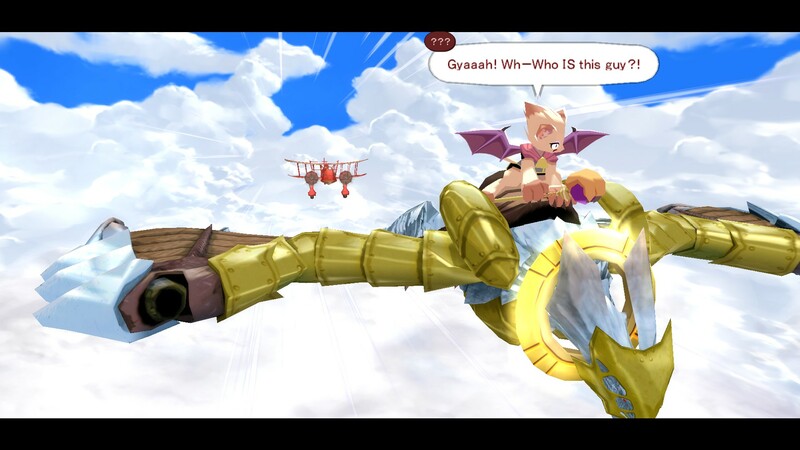 Or the even more ridiculous interactions that appear whenever you encounter Montblanc, your demon cat archenemy who assists in the shooting down of your beloved plan, the Tristan. Suffice it to say there are a host of lovable NPCs that you will encounter throughout your travels, each which adds another colourful layer to the wonderful world of Ilvard, including a cameo from some familiar faces from the land of Arges. This includes the monsters that you find yourself coming face-to-face with, which are more often than not adorable. The first time I came across a “Kobold” I actually walked up to it and tried to give it a hug, because in my mind there was no way this adorable little puppy with a miner’s hat on could ever cause me harm. And then it smacked me in the face and things got personal. Even though the graphics have not been updated since the game’s release — the game is a localization, not a remake — I honestly found that they still held up quite well. The character and monster models are all well detailed and rendered, and the world is a delight to explore. My only issue is that much like many JRPGs released in the early 2000s, the dungeon environments themselves got fairly repetitive with similar layouts and repeating textures. Zwei II also features a really cool Widget system that allows you to customize your HUD. After receiving the first two necessary widgets that contain the map and memo pad which gives you quest directions, you can then find or purchase additional widgets including a pedometer, the treasure nose which helps you “sniff” out loot, and a catchy little music player. None of these are inherently necessary, but they do provide some useful in-game benefits [not least of all the map and treasure nose] but additionally its just fun to switch them up and have the ability to customize your screen similar to how you would a smart phone is, simply put, a neat addition. Once you’ve reached the village of Roalta, you can even adopt yourself a furry little friend to accompany your on your adventures. Your pets also benefit from chowing down on tasty treats, and you can choose from a dog, cat, and a little bird! You little pet-friend is capable of helping you find items, but it will also join in the fray when you get ambushed in a dungeon; which for me was pretty useful. Your pet gains levels as you travel with it and you can only travel with one animal friend at a time, but luckily you’re allowed to switch out your animals if you so wish. The land of Ilvard is pretty large, and you’ll be traveling to all corners of the floating continent in search of Alwen’s lost magic. Luckily, you’ll run into conveniently placed Rest Stops in each village and at the beginning of — and most junctions in— dungeons. You can save at each of these red benches, as well as freely travel back to any that you have discovered at any time. This means that you do not need to actively be as a Rest Stop to be able to fast travel to another location, which becomes exceptionally helpful as you start to make deep dives into later dungeons and find yourself running low on food. 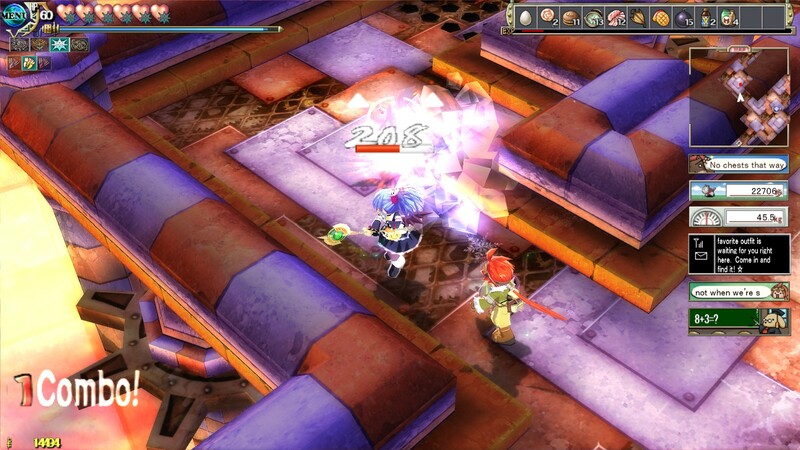 Zwei: The Ilvard Insurrection is a game with a lot of heart. This extends from the narrative through the characters, and moves from them to every facet of the game’s systems. No one aspect of Nihon Falcom’s localization stands above another, because the entire game has been treated with such care. I was constantly engaged during my entire playthrough of Zwei II, and have no doubt that it won’t be long before I find myself back in Granvallen. Between what easily constitutes one of the coolest level-up systems to ever grace a JRPG, exceptionally fast-paced and engaging combat, and some of the most personable characters and laugh-out-loud moments I’ve experienced recently, this is a game that every JRPG fan needs to play. There is just something that is wholly captivating about the world of Ilvard, and the localization of Zwei II is something that no JRPG fan should miss.